There are so many reasons to love viburnum! A member of the honeysuckle family, this pretty flowering shrub is easy to grow in almost any zone, and it can be trained to grow as either a bush or a tree. There are over 150 hardy varieties, many of which are resistant to insects and disease. Viburnums grow white, creamy or pink-toned flowers, and – since they are in the honeysuckle family – they can have a lovely, sweet fragrance. The most fragrant varieties are native to Asia, but two varieties, Cayuga and Burkwood, are known for their lovely scent and grow easily in the US. 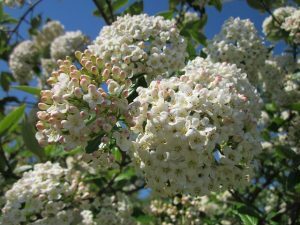 Most viburnums have either white or pinkish flowers which are sometimes fragrant. The most common types flowers viburnums generally produce either a snowball-like cluster that resembles a hydrangea, or a flat cluster that looks a bit like Queen Anne’s lace. Viburnums are also loved for their foliage, which can be either deciduous or evergreen and also comes in a variety of shapes. Some leaves are rounded, some are lance shaped. Some have uniquely colored that create a perfect foil for their flowers, as with Kern’s Pink, which creates a stunning effect by placing deep, dark green foliage against pale pink blooms. On many viburnums, the leaves turn rosy, orange or purple in the fall for a lovely autumn show. Berries: Many viburnums produce attractive berries that last for a long time. Some will last the entire winter. These berries add interest and keep the shrubs looking well even beyond spring and summer. Some gardeners even prefer the berries – which emerge in “eye-popping” shades of blue, red and purple – to the flowers. Attractive to garden guests: With all those flowers and berries, viburnums are a magnet for birds and butterflies. 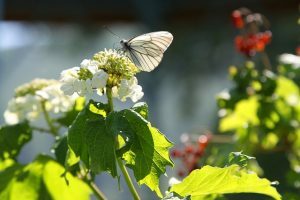 If you love having these flying visitors to your garden, these shrubs may an excellent choice. Viburnums like the Nannyberry are known for drawing in coveted birds like cedar waxwings, bluebirds and cardinals, as well as less common moths and butterflies. At the same time, viburnums are resistant to unwanted guests like pest insects and diseases. Direct sunlight? Dense shade? No problem: There are enough varieties of viburnum to suit any garden. Native varieties grow easily here. The Nannyberry, reference above, is a native viburnum that grows easily in moist, shady areas. The Southern blackhaw grows well in sun. Most native viburnum are adaptable, growing well in full sun to part shade. With fragrant flowers, vibrant berries and adaptability nearly any need or condition, we never run out of things to love about viburnum. If there’s anything we can do to help your viburnum thrive, just ask!